The rugged, agile and heavily armed Me109 was the only Luftwaffe fighter to be built and continually developed throughout the war. This robust fighter saw service in every theatre in Europe and the Eastern Front. 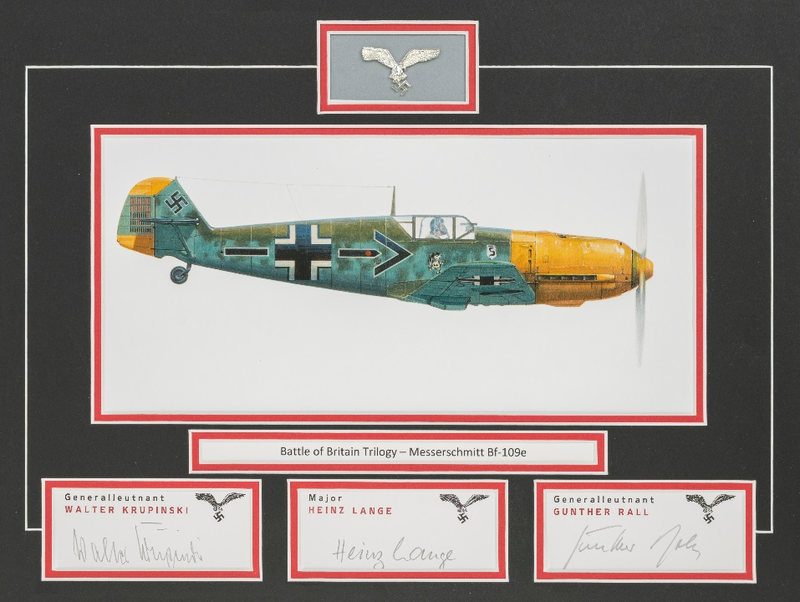 Many Luftwaffe fighter pilots – including the 275-victory ace Gunther Rall – preferring the Me109 in combat to any other German fighter produced in WWII. A familiar adversary of the RAF pilots in the Battle of Britain, this unique Ensemble is signed by three highly respected Luftwaffe aces who took part. Signed by: Walter Krupinski, Heinz Lange, Gunther Rall.